Despite being relegated to modern-day interior designers in touch with their "spiritual side," feng shui is traditionally a Chinese art form dating back nearly 6,000 years. The term translates literally to mean "wind-water" in English, where objects are oriented with the "invisible forces" of the universe (aka "qi") to bring about optimum energy, happiness, and harmony. 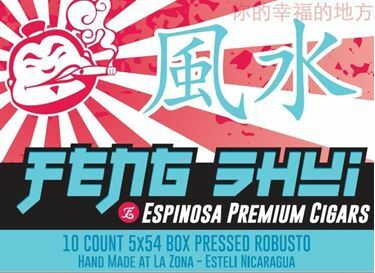 Introducing Feng Shui, a special collaboration between Espinosa Premium Cigars and Cigar Dojo. For this unique project, Cigar Dojo (aka "The Dojo") decided to get in touch with their Oriental influence. This can be seen in the cigar's box-pressed shape, which, when paired with the Oriental tobacco in the cigar's binder, created a harmonious experience worthy of the Feng Shui name. This box-pressed format not only makes for a smoother draw and cool smoking temperature, it allows the tobaccos to better meld into a cohesive blend. Crafted at the burgeoning La Zona factory in Estelí, Feng Shui begins with filler tobaccos from the Estelí (ligero) and Jalapa (viso) regions. The cigar then makes use of a double binder—a traditional Cuban technique—with leaves from Jalapa and Indonesia. Finally, Feng Shui is finished in a Habano Rosado wrapper and box-pressed to perfection! The cigars are rolled in a singular 5" x 54 robusto format, offering enthusiasts a medium-bodied smoking experience that focuses on supreme balance and harmonious flavor. Only 300 bundles of Feng Shui have been crafted and are offered exclusively through Payless Cigars and Pipes. Act now while supplies remain!